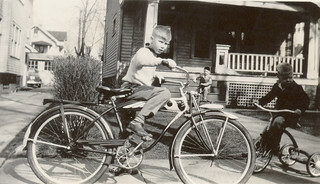 I am on my Schwinn bicycle in front of our house on Richland Avenue, in Lakewood, Ohio. It is a new bicycle. I did not learn to ride a bicycle until we moved to Lakewood in 1945, when I was nine years old. I guess this photo was taken around my tenth birthday in 1946. My brother David is on the tricycle. I do not recognize the boy on the steps. He may be one of the Hacketts, who lived next door, to the right of the photo. The Schwinn bicycle was a heavy American bicycle. No gears. The lighter bicycles which are now the standard were called English bicycles, and were a luxury in the 1940s. The bicycle had a spring between the frame and front wheel assembly, which was supposed to give a smoother ride. I found it an annoyance, because the lack of a rigid connection meant that I could not have a basket on the bike. The only thing I could use was saddlebags, which went over the rear wheel. This is the only bicycle which I owned, until I moved to Sarasota in my late 50s.. I kept it through high school, at least until I got a driver's license near the end of my junior year. I used it to deliver afternoon newspaper routes both in Lakewood and in Millburn, New Jersey.